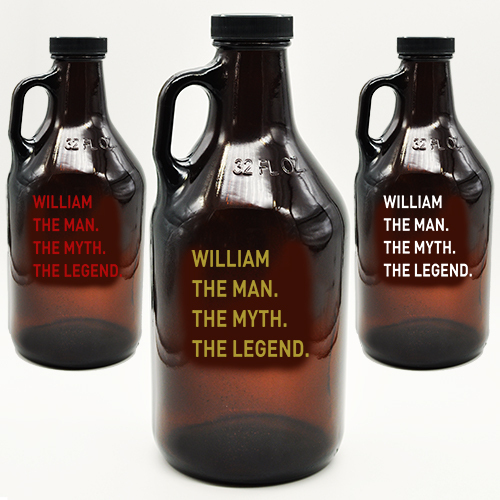 Don't let your reputation go without acknowledgment with this 32 or 64 ounce Amber Growler. Your name is added to the top line with The Man, The Myth, The Legend confirming your status. 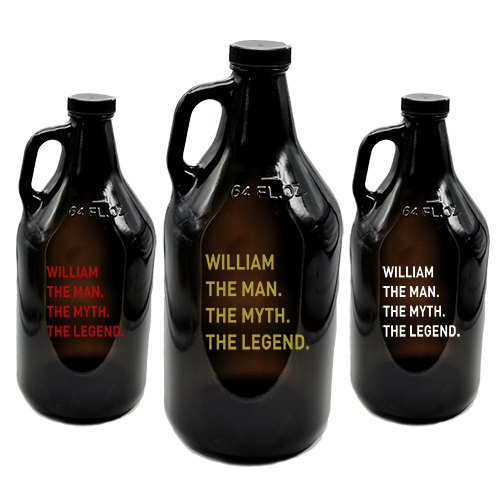 With all the testosterone at your next poker night, make sure your buddies are reminded of your social status with this customized The Man, The Myth, The Legend 32 or 64 ounce amber growler. Impress them with your newest home brew by pouring it into a chilled beer mug. Your name will be added to top of the design. Choose your sandblasting color: natural eteched, red, white or gold color filled. Growler is customized in the USA. Screw top lid included. Hand Wash Only!